27 year old Nikole Angelica Jolivet, of Houston, is facing a felony charge. Houston Woman Facing Felony Charge for Reported Stolen Vehicle, LIVINGSTON, August 27, 2015 - Shortly after 5 pm on August 26, 2015, Livingston Police Department received a call from Houston about a vehicle that was in Livingston and reportedly stolen. The vehicle, a red Dodge Charger, was allegedly stolen from a Houston car dealership. The dealership called LPD to inform them that they knew exactly where the car was because they had a vehicle locator on the car. Sergeant Ronnie Bogany and Officer Scott Paske (both with LPD) were dispatched to the parking lot at Pineborough Shopping Center (next to Payless Shoes) off US-59. 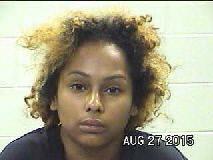 The officers detained Nikole Angelica Jolivet, 27, of Houston, and transported her to Livingston Police Department. She was later booked into Polk County Jail and charged with unauthorized use of a motor vehicle (felony). The Houston car dealership had a vehicle locator on the car and was able to track its exact location and call Livingston Police Department. Sergeant Ronnie Bogany and Officer Scott Paske were dispatched to investigate. Nikole Jolivet was taken into custody and driven to LPD for questioning. Officer Scott Paske escorts Jolivet into police headquarters.